I love those cute little Halloween villages that are seen in the stores. But, they can get rather expensive and I don't like spending a lot on Halloween décor. 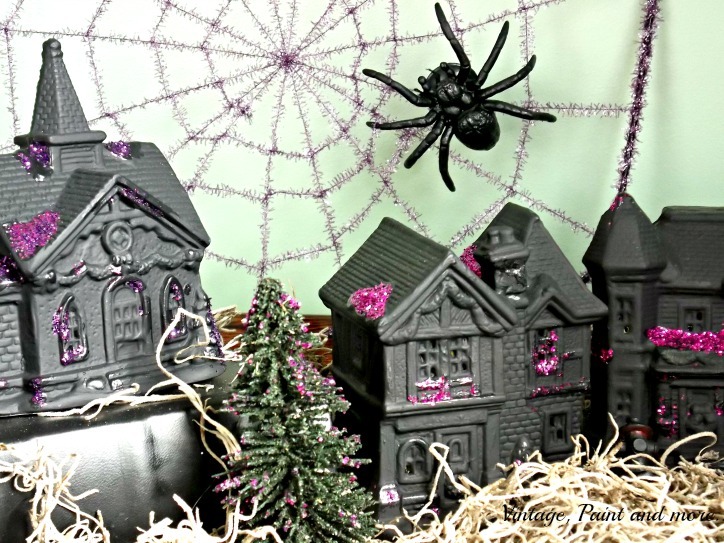 I wanted to do an easy craft for Halloween with Miss A. She loves crafting and helping Grandma make things. She also loves painting and glitter. So I went to Dollar Tree and purchased five of their little Christmas village houses and a package of bottle brush trees. We then proceeded to paint each piece with black chalkboard paint. After they dried we brushed a little mod podge on in random spots and then sprinkled with purple and pink glitter. Just enough to give it a little glitz. And with that we have accomplished the paint and glitter that she loves to play with. She then put some dried moss down in a wooden tray (to keep the mess in one spot.) and arranged the houses and trees to her liking. (This, of course, took several attempts and rearrangements before she was satisfied.) 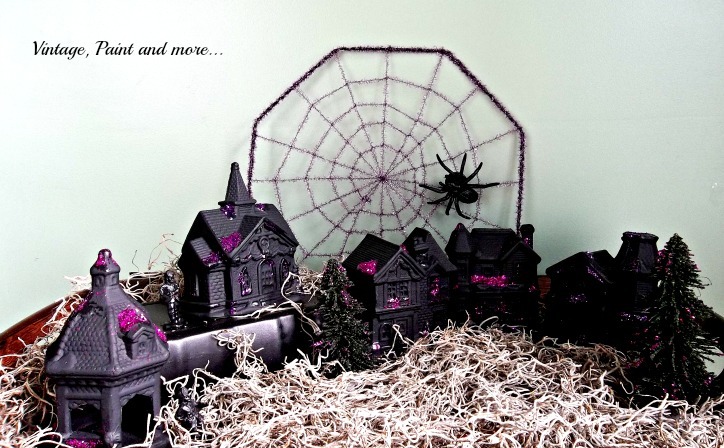 We had an old purple glitzy spider web with a big spider in it to set at the back of the village. 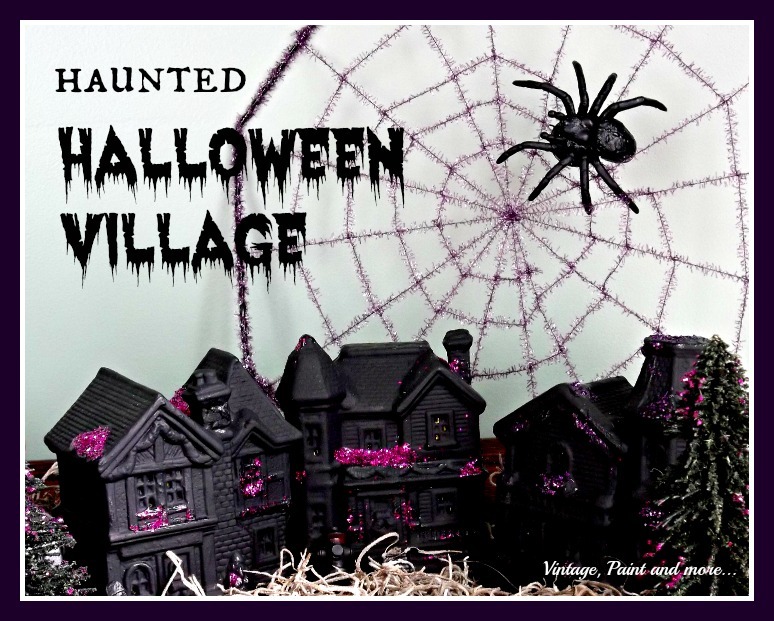 Do you do a Halloween village? I have seen many from simple to quite elaborate. OFGosh...that Halloween Village is adorable! What a frugal, but adorable craft to create with the grands! I bet my own littles would have fun with this. They love when I put out the Christmas Village each December. Dropping by from Tweak it Tuesday! What a cute idea! 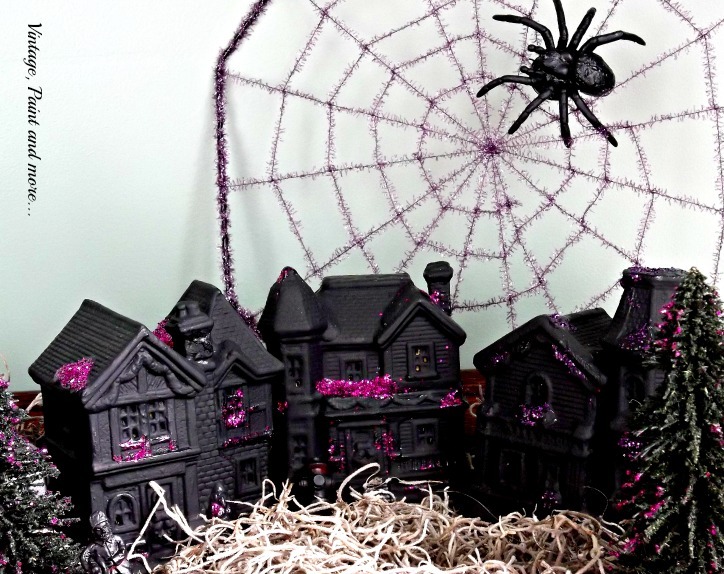 I love the Halloween village, I'll be on the look out for little houses now! So cute! I love the idea of just buying the village pieces from the dollar store and spray painting them... seriously genius!! I can't wait to make one of my own, thank you for sharing. What a great idea! Pinning so I'll remember next year. This is such an awesome project! Gotta love that Dollar Store. Thanks for sharing at the Krafty Inspiration Thursday Link Party, you have been chosen as one of the top 5 featured posts at tomorrow’s party.